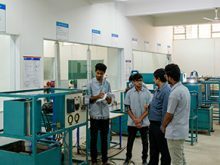 Department of Mechanical engineering currently offers an undergraduate program and a doctoral program covering research areas like New and Smart materials, Renewable energy sources, Metallurgy, Kinematics and Manufacturing Sciences. 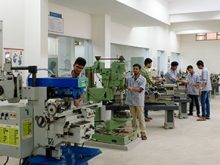 Mechanical Engineering is regarded as one of the evergreen branches of study in the field of engineering. Mechanical engineering applies Physics and Materials science principals to design, analyse, manufacture and maintain mechanical systems. It is the field that covers the design and analysis of all kinds of systems, technologies and also has its applications in energy production, environmental systems, composite materials, transportation, robotics, automation manufacturing and many more. 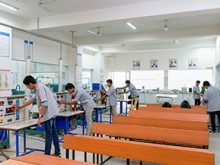 Skilled mechanical engineers with computer proficiency in software tools including 3D AutoCAD, Solid Works and 3D Max, CAD/CAE/CAM, heating ventilation, air conditioning and product data management are in huge demand and are offered higher salary packages by the industry. 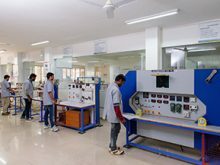 All the faculty are engaged in research activities in the areas of Mechanisms, Metallurgy, Bio and Renewable energy sources. 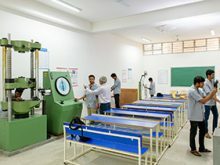 They regularly participate in seminars, conferences, paper presentations and various other faculty development programs. 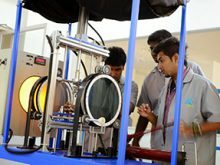 In the academic year 2017-18 the department has established two Centres of Excellence (CoE): Metallurgical Sciences and Additive Manufacturing. 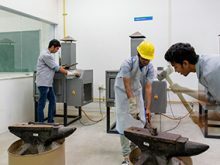 The Metallurgical Sciences CoE is DST funded, while the Additive Manufacturing CoE deals with 3D printer prototypes, 3D printers, 3D printing techniques and latest 3D printing machinery and many more. 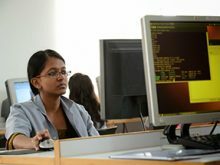 Several faculty members and student groups regularly contribute to the CoEs. 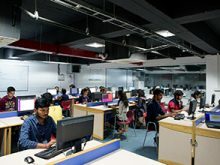 The students receive personalized attention, with intensive coaching modules for slow learners, and specialised training for potential rank holders. 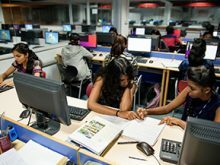 We get the best of VTU results with 100% success rate in many subjects. Besides students are encouraged to present papers, participate in technical competitions, quizzes and many other extracurricular activities. M1: Build and sustain a committed faculty team with a balance of academic and industry exposure capable of producing professionals competent in Mechanical Sciences and Engineering. M2: Impart knowledge focusing on fundamentals and facilitate experiential learning, experimentation and research. 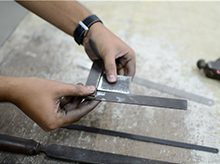 M3: Collaborate with industry and institutes of repute for research, consultancy and professional training. M4: Carry out interdisciplinary projects to provide viable and feasible technological solutions for rural and agricultural sectors. PEO-1: Demonstrate an understanding of the principles of mechanical engineering in solving engineering problems in core and related domains. PEO-2: Add value to an organisation as professionals in teams and in lead roles. PEO-3: Contribute to society by providing creative and innovative solutions. PEO-4: Pursue higher education and research in the institutes of national and global repute. PEO-5: Create jobs for people by becoming entrepreneurs themselves. PEO-6: Practice their profession in an ethical and responsible manner. PSO1: Apply principles of physics, knowledge of material properties and strength, manufacturing methods, design codes and standards, and best practices to design, analyze and develop solutions in engineering and service sectors. PSO2: Contribute to the project teams in the core and associated domains by applying knowledge of engineering graphics to read, interpret and create an engineering drawing, and by using modern tools for drafting, modeling, analyzing and simulating the product. PSO3: Identify and articulate industrial problems and solve with the use of management tools for optimum solutions and realistic outcomes. PSO4: Translate fundamental knowledge of thermal sciences and attempt solutions independently for real life situations.